Indigenous folklore of the Pacific Northwest told of cannibalistic hairy men and giants who roamed the great forests and mountains of the region, abducting children in the dead of night and sabotaging the salmon-catching nets of local fishermen. America's interest in Sasquatch  later to become known as Bigfoot  grew after stories of its existence were serialized in newspapers at the turn of the 20th century. The craze went into overdrive in 1967 after two Californians screened a short documentary of footage they had allegedly filmed of the monster; the film filled out a few local movie theaters and scored them appearances on TV talk shows. (The iconic image of a frame from their video is shown here.) This spawned decades of mostly fruitless Bigfoot hunts, as well a series of hoaxes, and led to the establishment of various societies devoted to the search. A friend of the 1967 filmmakers later claimed that the creature had been him in an ape costume, roving through the woods, though competing theories still abound. 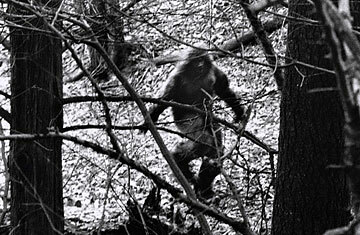 Following suit, in 2008 two men claimed they had uncovered the body of a Sasquatch. Most of the U.S.'s major news networks sought images of the beast's corpse  only to find that its head was hollow and its feet were made of rubber. Read "Bigfoot Lives! No, Really!" and other oddball news stories of 2008.